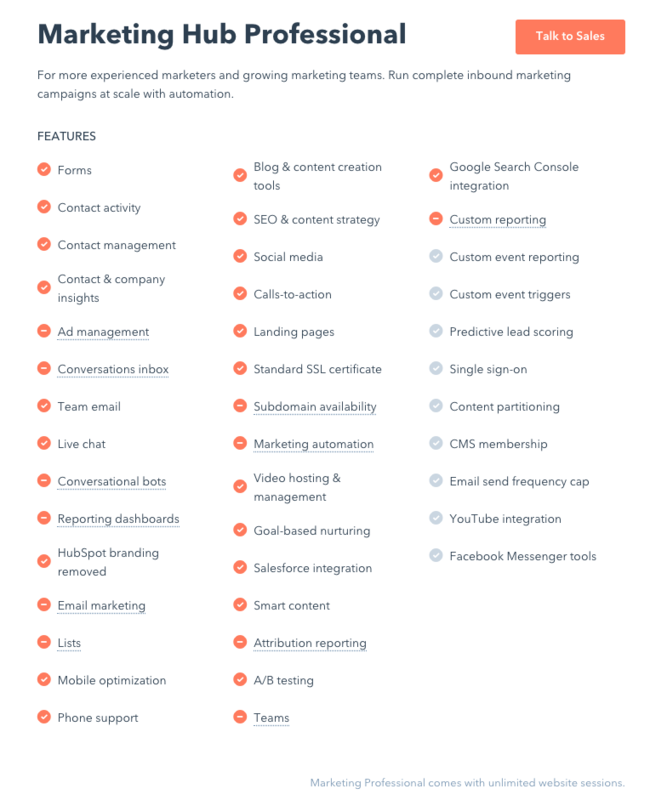 What is HubSpot’s Social Media Tools? 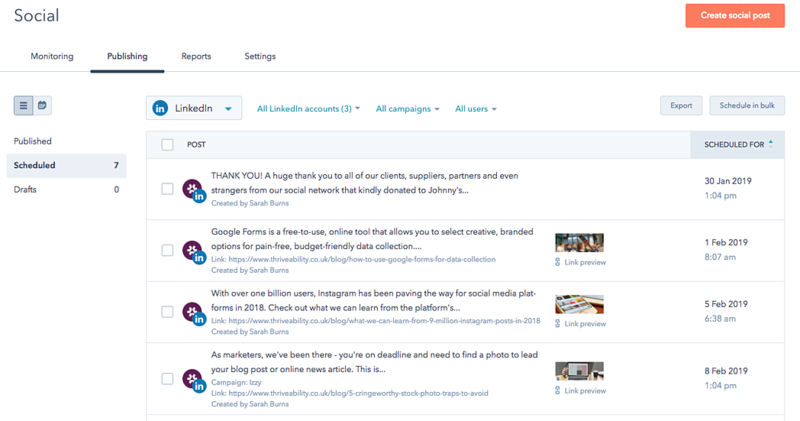 An added bonus of HubSpot’s Marketing Hub Professional or Growth Suite Professional is its integrated social media management tool. The tool allows you to create and publish social posts to promote content from your blog posts or landing pages. You must have a Professional level of either HubSpot’s Marketing Hub or Growth Suite. Marketing Hub Professional starts at £655pcm for UK users. Professional Growth Suite starts at £987pcm (including marketing, CRM, sales and service features). In your HubSpot account, navigate to Marketing > Social. From here you can access all of the messages published as well as set up your Social Inbox for monitoring your social activity. To begin, you will need to link your social media accounts to your HubSpot account. Bear in mind, that as of April 2019, it will no longer support Google+ ahead of the platform’s shutdown, and as of August 2018, it doesn’t support posting from personal Facebook accounts. Remember, not every business should use social media and you certainly shouldn’t use any and every platform ‘for the sake of it’. Focus on your buyer personas, where they’re conducting their market research and where they want to be communicated to - what content formats do they prefer to dissect? From the ‘Social’ platform, click ‘Publishing’, this will show you all of your scheduled messaging. To create a new post, click the orange button, towards the top right of your screen, ‘Create social post’. 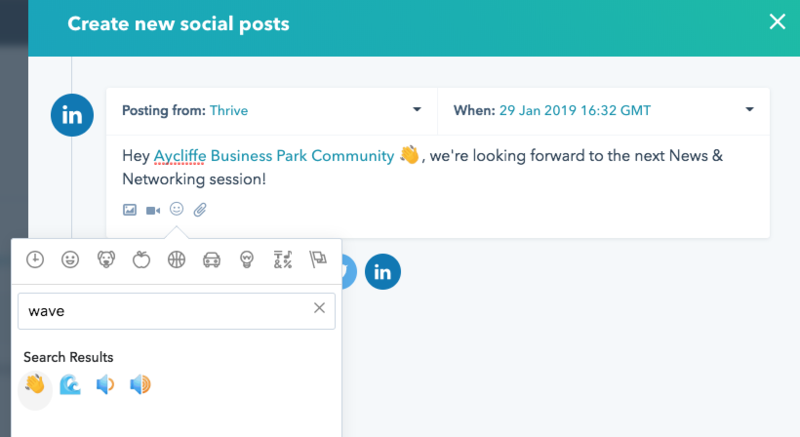 Once you’ve selected your network you can schedule and customise your social post in a similar fashion as you would with Hootsuite or most other popular social media management platforms. You can select the profile you will be posting from in the top left, ‘Posting from’. You can update your scheduled message to any date and time, including ‘Publish now’, using the ‘When’ function. You can add images, videos, emojis and links using the buttons below the ‘compose message’ text box. You can also tag a user using the @ symbol as you compose your message. Instagram mentions will not be auto-completed, but Instagram will acknowledge the mention when the post is live. Facebook and LinkedIn's APIs only allow mentions or tags for Facebook pages or LinkedIn Company Pages. Individual Facebook or LinkedIn users cannot be mentioned when creating a social post in HubSpot. Only Twitter accounts you follow will show up in the auto-complete dropdown menu. To mention Twitter accounts you don't follow, enter the full Twitter handle. Twitter will acknowledge the mention when the post is live. We love using Canva to create social media images, it can produce some fantastic templates which you can ‘brand up’ perfect for brand awareness and recognition online - and it’s totally free! Our team also makes great use of Feedly, a content curation tool, similar to an RSS feeder that allows you to categories various websites, publications and blogs for easy reading. This means you can share relevant articles with little effort to boost your content mix, i.e. our Feedly board for Thrive includes content from HubSpot, The Drum and Adobe.